ICS Sign Pro 4.0 digital signage products can be used in multiple venues from retail advertising, corporate headquarters, call centers, factory floor environments, trading floors, banks etc. You can configure a system from one screen to hundreds of screens and have full control and easy access to scheduling a presentation on each. The ICS Sign Pro Plus 4.0 Manager can control multiple presentations and schedules on each ICS DVC player. To learn more contact ICS Technology Inc. The system is configured to operate over a standard network with minimal network overhead. This can be a local or wide area network. There is a wide variety of content that can be presented in your screen presentations . You can play text, video, pictures, PowerPoint, web browser, flash, PDFs, scrolling text, RSS feeds, live TV broadcast, and also you can have your presentation interactive. 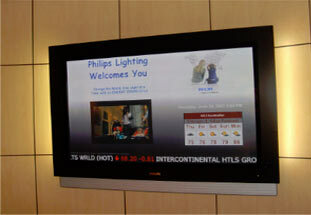 Sign Pro system can be set up as interactive for office directories or any type of kiosk. We also offer database retrieval capability enabling you to update content on the screen just by making a change in a database for use on menu boards, office directories, flight information, class schedules. Any information that you can store and update in a database we can display on the screen in real-time.